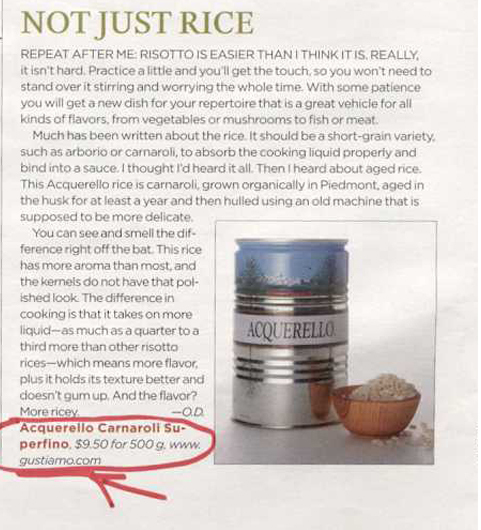 In the April issue of Wine Spectator, Owen Dugan writes about Acquerello Rice and starts his article with: REPEAT AFTER ME: RISOTTO IS EASIER THAN YOU THINK. REALLY. Really!!! I am the proof of it. Last night, I didn’t know what to cook and had very little in the house. There were some chopped onions and carrots in the refrigerator and Acquerello and porcini mushrooms in the pantry. I made a REALLY great risotto, even using water instead of broth. This is how you do it: You make soffritto, add the rice, a glass of cognac, then the boiling water…half cooked, you add the porcini (previously soaked) to the rice. No need to stir, either, just add water. It was my improvisation and everybody loved it, at home and in the office at lunch, today. 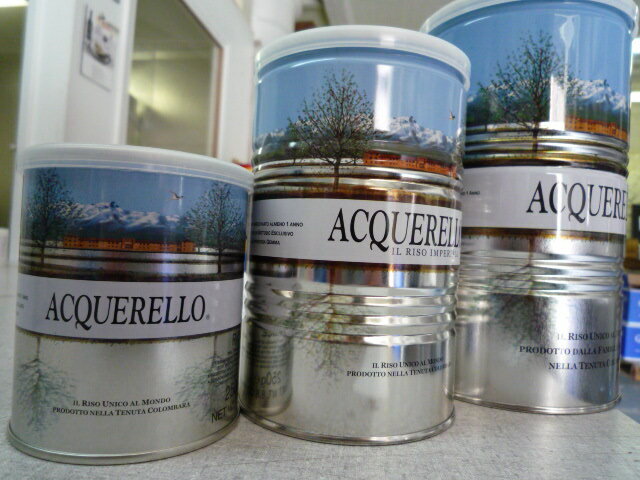 Until recently, we only carried the 1 kilo and 1/2 kilo tin of Acquerello. Too big for you? Perhaps too expensive and you don’t want to make the investment? If you are cooking for 4 or less people, the newborn 1/4 kilo tin is perfect for you! At $5 per tin, you must try it and let your creativity run free. What do you have to lose? If you need tips/suggestions on how to cook vero italian risotto, give us a call at 718 860 2949. Next Post If You Are Anywhere in Italy, Le Calandre Is Worth a Detour!!! 3) Drain the porcini mushrooms and mix with the onion “soffritto”. Keep the liquid.